Perched at 1500m altitude, Meribel is the central valley of the 3 Valleys ski domain and is a white gold mine, constantly bubbling with activities. All of the businesses in the valley participate to bring you a calendar full of events accompanied by local products, enhanced by fun animations with cheerful choreographies and sprinkled with a little crazyness … Where do we start? Mission Black Forest, a 3km sledging run not for the faint hearted. From the Tougnete mid-station down to the Chaudanne, open every afternoon apart from Saturday, for everyone little and large. The mythical Himalaya by Night experience: hurtle down the Yeti Park ski run in Meribel-Mottaret under the stars on a sledge. The traditional market showcasing local produce takes place every Tuesday and Friday in the centre of Meribel. Oxygene is a ski & snowboard school that believes first and foremost that learning to ski should be fun. 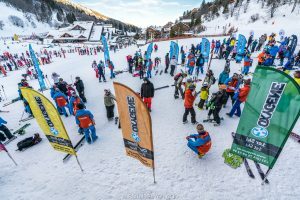 To this end we have created some great events in conjunction with our ski lesson programme, for the enjoyment of our young skiers but also for their parents. Crazy Hat Day: Every Thursday, children’s group lessons come alive and helmets are decorated with garlands, balloons, funny hats, colours and sequins. The skier with the craziest helmet wins an Oxygene goodie bag. Follow our Facebook page and participate in our Crazy Hat Day event, every Thursday. 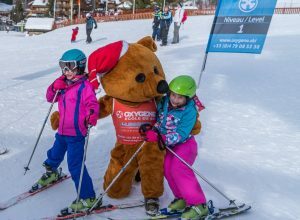 The Oxygene bear puts on a show … but you never know when: In Meribel, Ollie the Oxygene bear is already a recognised star. Well, he is the best skier in Bear Country, and he likes to pop by and show off his skills, visiting the children during their lessons, on Crazy Hat Day or at the medal ceremony at the end of the week. He never misses the opportunity to put on a show, like at Christmas when he became “Santa Bear” giving out goodies at the Chaudanne. The Medal Ceremony: on Friday afternoons after ski lessons end we celebrate the progress of our little skiers with a hug from Ollie and some dancing on the snow-front and of course by giving them their progress medals. It’s also an opportunity for everyone to meet up at the end of the week over a warming hot chocolate. The 3 Valleys have made selfie spots in 6 locations across Courchevel, Meribel, Val Thorens and Les Menuires where you can take an awesome HD selfie from the best angle. A free photo from the top of the Col de Loze for you to remember your stay in Meribel is good, but 6 photos from the highest peaks in the 3 Valleys – now those are memories worth keeping. Challenge your friends to travel the distance on the slopes of the 3 Valleys to complete your collection of photos. Download the 3 Valleys selfie app to your smartphone, smile for the camera and get the photos directly to your phone. Let’s go!